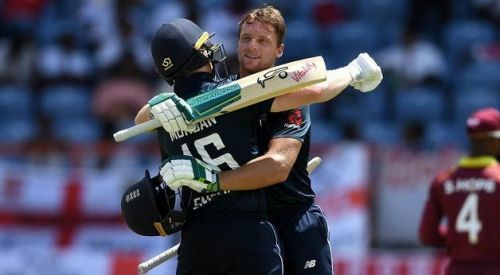 It was an amazing day of cricket for the fans as England defeated West Indies by 29 runs in a high scoring thriller played at Guyana on Thursday. Thanks to scintillating hundreds from Morgan and Buttler, England posted a massive 418/6 in 50 overs. Despite Chris Gayle's 162, West Indies fell short of the target. West Indies captain Jason Holder won the toss and decided to field first. England openers Alex Hales and Jonny Bairstow put pressure on West Indies bowlers right from the start. England raced to 89 for 0 at the end of first 10 overs. Jonny Bairstow reached his fifty off just 31 balls. Oshane Thomas broke the dangerous partnership by dismissing Jonny Bairstow for a well-made 56. Jonny Bairstow and Alex Hales added 100 runs in just 13.5 overs. Oshane Thomas struck again with the wicket of Joe Root. At the other end, Alex Hales reached his fifty off 47 balls. England captain Eoin Morgan played with positive intent and added 45 runs for the 3rd wicket. Alex Hales was then dismissed for 82 off 73 balls. Jos Buttler came to the crease and smashed the West Indies bowlers with ease. Eoin Morgan reached his fifty off 55 balls while Jos Buttler scored his 50 off just 45 balls. Both batsmen continued to pile on the pressure on the West Indies with aggressive hitting. Jos Buttler reached his century off just 60 balls while captain Eoin Morgan completed the milestone off 86 balls. Jos Buttler and Eoin Morgan added 204 runs for the 4th wicket. Jos Buttler reached his 150 off just 76 balls. England posted a massive total of 418 for 6 in 50 overs. Chasing the massive target of 419 runs to win, John Campbell and Shai Hope were dismissed cheaply. Chris Gayle took on England with some massive hits. West Indies were 75 for 2 at the end of 10 overs. The hard-hitting left-handed batsman reached his fifty off just 32 balls while Darren Bravo took time to settle before putting pressure on England batsmen. Gayle was in a severe hitting mood and reached his century off just 55 balls while Darren Bravo reached his fifty off 54 balls. Mark Wood dismissed Darren Bravo for 61 to end a superb 176 runs stand for the third wicket. Shimron Hetymer was dismissed cheaply for six runs. Chris Gayle continued his great hitting by reaching his 150 off 85 balls. Ben Stokes got the big wicket of Gayle for a brilliant 162. When everyone thought the game was over, Carlos Braithwaite and Ashley Nurse revived West Indies hopes of winning the match by adding 88 runs for the 7th wicket. Braithwaite reached his maiden ODI fifty off 35 balls. However, Adil Rashid took 4 wickets in an over to help bowl out West Indies for 389 in 48 overs. Brief scores: England 418 for 6 in 50 overs (Jos Buttler 150, Eoin Morgan 103, Alex Hales 82, Jonny Bairstow 56, Carlos Braithwaite 2/69, Oshane Thomas 2/84) beat West Indies 389 in 48 overs (Chris Gayle 162, Darren Bravo 61, Carlos Braithwaite 50, Adil Rashid 5/85, Mark Wood 4/60) by 29 runs.